You know what I love? Easy, simple meals. 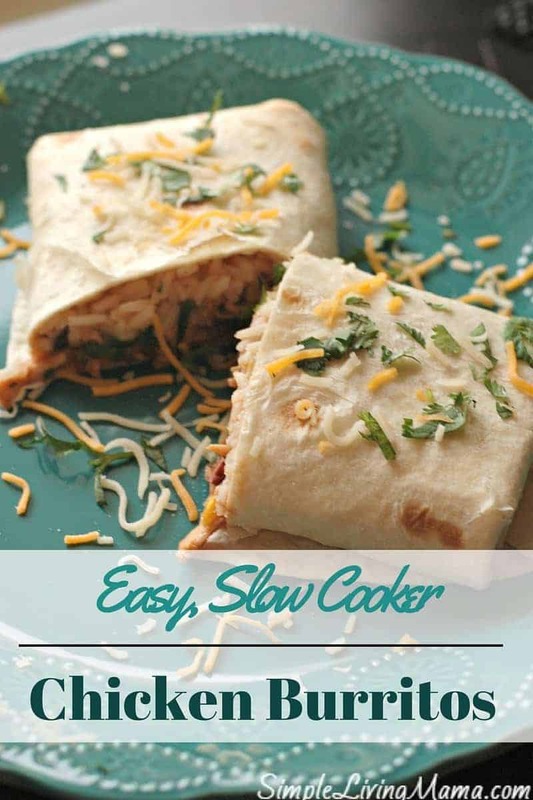 Slow cooker meals top my list of easy meals. I believe every mom should have a few favorite slow cooker meals tucked away in her back pocket. Slow cooker meals literally save us from the drive through. As long as I plan ahead on a busy day, I can put dinner in the Crock Pot in the morning and it’s ready for us in the evening. Those are the best simple living recipes. 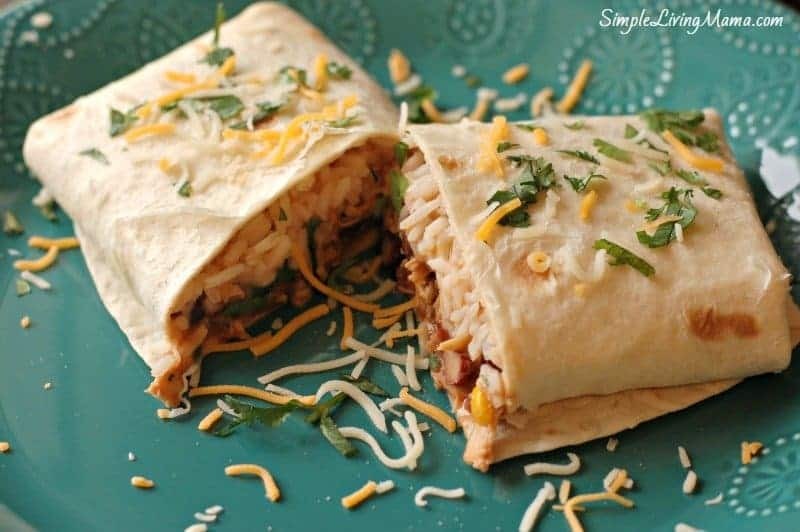 These easy slow cooker chicken burritos are no exception. 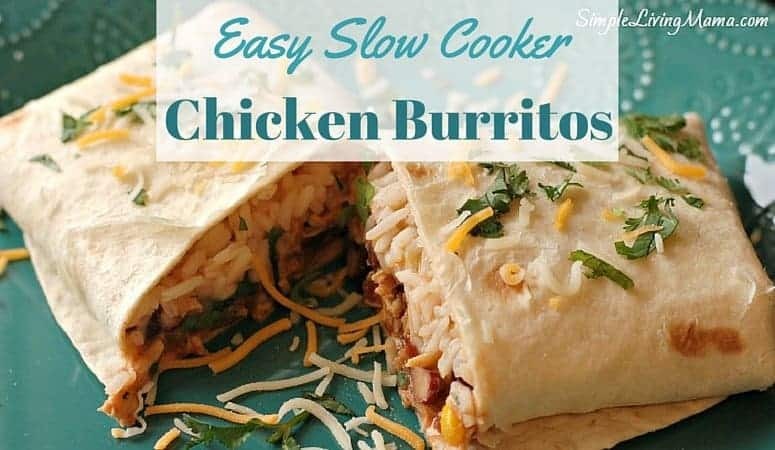 My hubby actually came up with the concept of slow cooker chicken burritos. He was looking for a something to make while I was on bedrest after having our fifth baby, so he decided on this recipe. The first time he made it was on a day that I had a doctor’s appointment. I came home to a clean house and dinner. That’s a win in my book! A lot of these ingredients are items I include in my pantry and they are always on my master grocery list. Even if we don’t have all of the ingredients, this recipe is so easy to improvise. All you do is throw a few ingredients into the slow cooker and let it cook for several hours. Place all ingredients except for rice, cheese, and tortillas in the slow cooker. Cook on low for 6 hours, or high for three hours. Remove chicken from slow cooker and shred it. 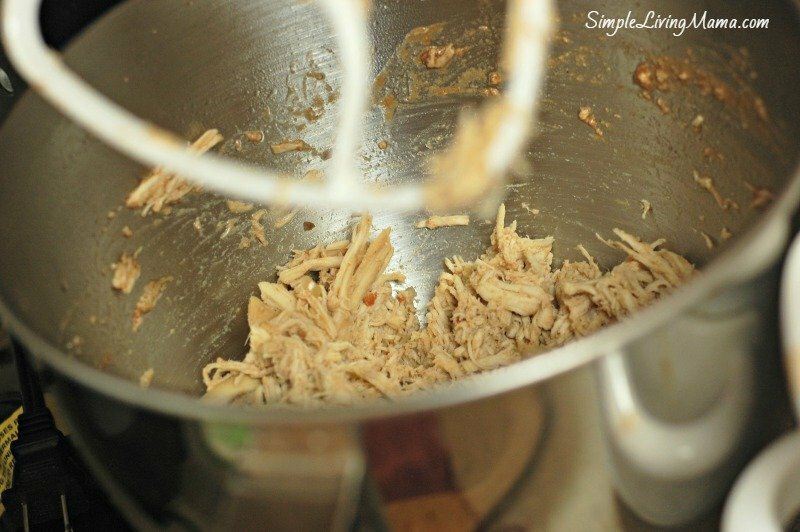 My favorite way to shred chicken is in my Kitchenaid stand mixer. Place the shredded chicken back into the slow cooker and mix. Now you’re ready to begin assembling your burritos! Place some cooked rice on a burrito size tortilla. Then, top with the chicken mixture. Add any other toppings you want such as chopped cilantro, salsa, or guacamole. And get ready to enjoy a simple, yet delicious meal! This meal is now in our regular rotation of frugal meals. We all love it! The best part is that this recipe makes a ton of leftovers, so we can eat it for lunch the next day! 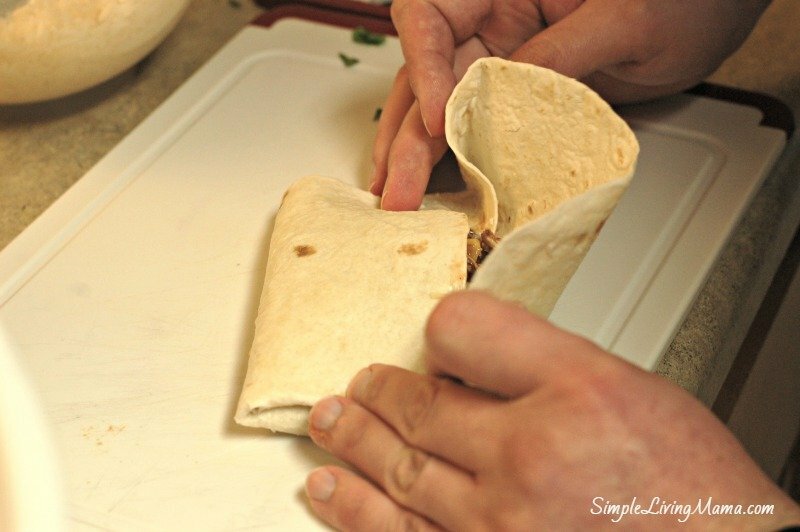 An easy prep slow cooker recipe for chicken burritos. Most ingredients are probably in your pantry already! Place all ingredients except for rice, cheese, and tortillas in the slow cooker. Cook on low for 6 hours, or high for three hours. Place chicken back into slow cooker and mix. 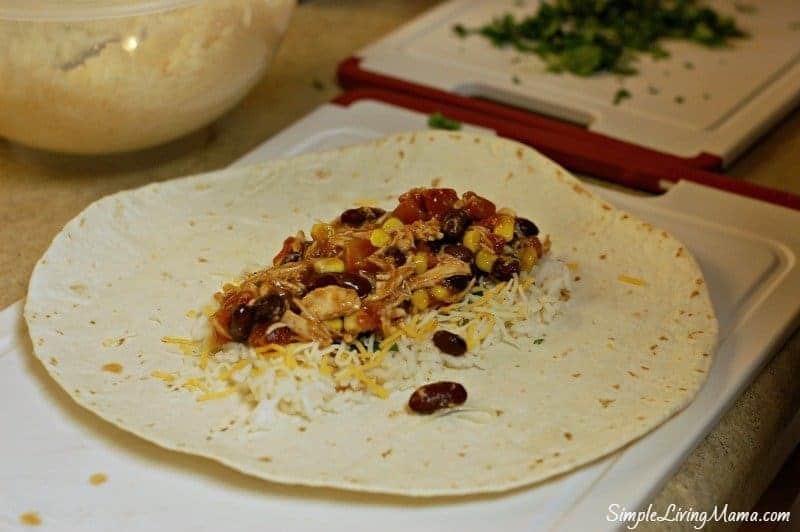 Spoon rice, chicken mixture, and other toppings into a burrito tortilla and fold.